James Kitfield at breakingdefense.com offers an interview with the retiring director of the Defense Intelligence Agency. In this exclusive exit interview with Breaking Defense contributor james Kitfield, the outgoing chief of the Defense Intelligence Agency, Lt. Gen. Michael Flynn, talks about metastasizing Islamic terrorism, his struggles to reform intelligence-gathering, and the risk of lurching from crisis to crisis in an Internet-accelerated world. – the editors. “Disruptive.” That’s how Michael Flynn’s enemies reportedly described him during his time as director of the Defense Intelligence Agency, a tenure that ends tomorrow – a year early – when the three-star general retires after 33 years in the U.S. Army. 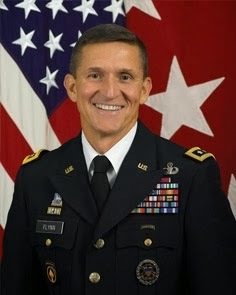 Was Flynn forced out? The Pentagon said his departure had been “planned for some time” when it made the announcement in April. But Flynn had challenged the Obama administration narrative that al-Qaeda’s brand of nihilistic extremism had died with Osama bin Laden in 2011. He had bruised egos at the DIA trying to transform the 17,000-person bureaucracy into a more agile and forward-deployed intel operation, one shaped by the lessons he had learned as intelligence chief for Joint Special Operations Command in Iraq and Afghanistan, working for the ill-fated iconoclast Gen. Stanley McChrystal. As early as 2010, Flynn made waves with a report, Fixing Intel, that said US intelligence could not answer “fundamental questions” in Afghanistan.